Abell 115 has been extensively studied since its discovery as a double X-ray peak by Forman et al. (1981). White et al. (1997), Shibata et al. (1999), and Gutierrez & Krawczynski (2005) have also studied its X-ray properties. In the most recent X-ray analysis based on Chandra X-ray observations (50 ks; note that currently there are 360 ks in the archive), Gutierrez & Krawczynski (2005) find that the northern and southern subclusters have cool cores (~3 keV) that are significantly cooler than the surrounding gas (~5 keV) and the hottest gas (~8 keV), which is located between the two subclusters. It is atypical for there to be two cool cores in a post merger system. Barrena et al. (2007) conducted a spectroscopic survey of the A115 system obtaining 88 cluster member spectra, following up on an earlier survey by Beers et al. (1983) using 29 redshifts. In addition to clearly detecting the northern and southern subclusters Barrena et al. 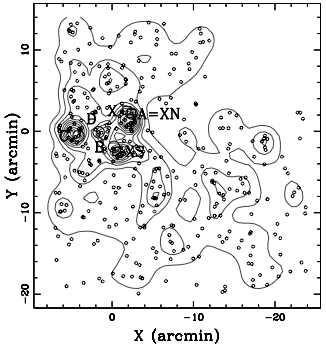 (2007) also find evidence for two smaller subclusters to the east (~0.5 Mpc). Barrena et al. (2007) interpret the system as being a pre merger based on the agreement in location of the BCG's and two X-ray peaks. However the Gutierrez et al. (2005) X-ray analysis based on a 50 ks Chandra observation as well as a more recent work based deeper 360 ks Chandra observations (private communication van Weeren) show that the gas is actually disturbed, suggesting that there has been a glancing merger. Barrena et al. (2007) find a line-of-sight velocity difference between the north and south subclusters of 1646 km/s and a projected separation of 0.89 Mpc. They also use their spectroscopic data to estimate galaxy types and find that two thirds of the galaxies in the northern subcluster core are active galaxies, while no activity is found in the southern subcluster galaxies. They speculate that since the northern subcluster is less massive its galaxies may be experiencing more star formation since it is more easily disturbed by the merger. Okabe et al. 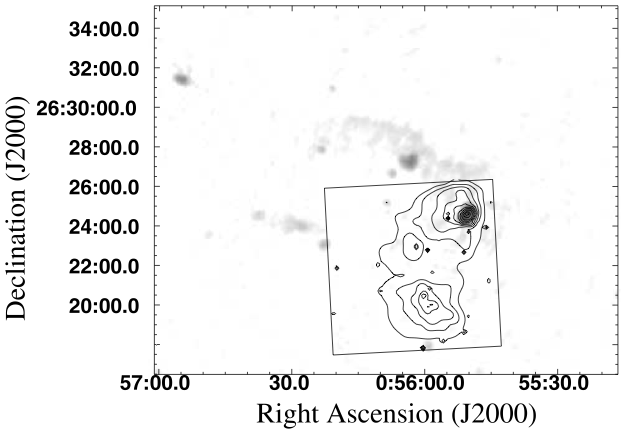 (2010) performed a weak lensing analysis of A115 based on Subaru SuprimeCam imaging, as part of LoCuSS, and detected the north and south subclusters at a significance of ~4 and 5 sigma respectively. Interestingly the both the north and south lensing peaks are offset from the corresponding galaxy density peaks (both luminosity and number), by what looks like a significant amount. Okabe et al. (2010) only noted the complexity of this merger in passing stating that it is the reason for it being an outlier in their one-dimensional lensing analysis. Oguri et al. 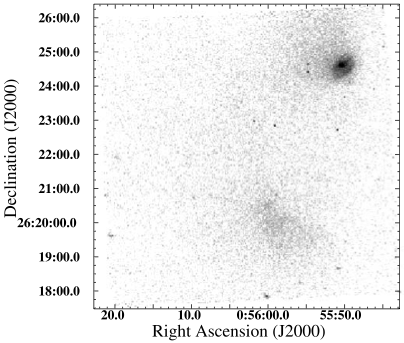 (2010) conducted the two-dimensional lensing analysis of this sample but made no significant note of the system. Giovannini et al. 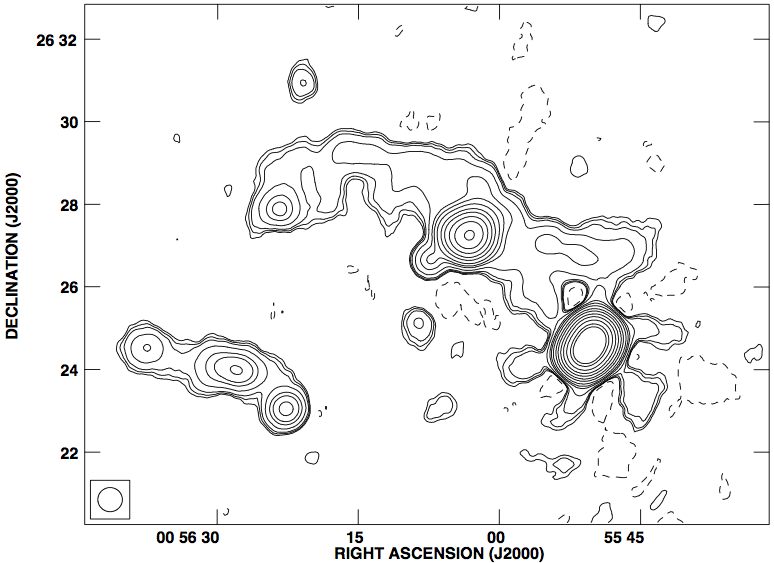 (1997) conducted a 4.9 GHz VLA observation of the cluster primarily studying the bright radio galaxy source near the northern radio relic. Govoni et al. (2001) followed this with a 1.4 GHz VLA observation and discovered the diffuse radio emission north of the cluster believed to be a radio relic. 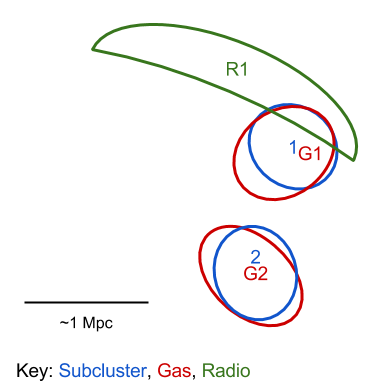 They note that there are two radio bright cluster members embedded in the diffuse relic emission (this will make studying the radio relic difficult). The relic is highly extended (~2.5 Mpc x 0.5 Mpc) perpendicular to the supposed merger axis, however they note that the relic seem rather close to the northern cluster. They briefly consider whether the relic is actually from a foreground source but rule out the possibility of it being a SN remnant. Based on Figure 4 of Gutierrez et al. (2005) and approximately on Okabe et al. (2010). Note that this list is not comprehensive. Forman, W. et al., 1981. Einstein imaging observations of clusters with a bimodal mass distribution. The Astrophysical Journal, 243, pp.L133–L136. Beers, T.C., GELLER, M.J. & HUCHRA, J.P., 1983. Galaxy clusters with multiple components. II - Abell 115. 264, pp.356–363. Giovannini, G., Feretti, L., & Gregorini, L. (1987). 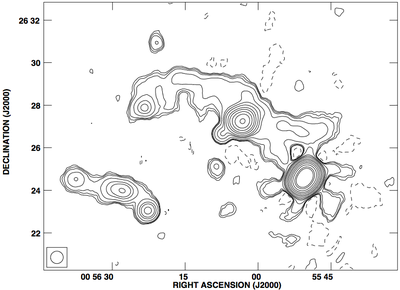 Radio observations of the first ranked galaxies in A98, A115, A160, A278 and A568. Astronomy and Astrophysics Supplement Series, 69, 171–182. White, D.A., Jones, C. & Forman, W., 1997. An investigation of cooling flows and general cluster properties from an X-ray image deprojection analysis of 207 clusters of galaxies. Monthly Notices of the Royal Astronomical Society, 292, p.419. Shibata, R. et al., 1999. Temperature Variation in the Cluster of Galaxies Abell 115 Studied with ASCA. The Astrophysical Journal, 524(2), pp.603–611. Govoni, F., Feretti, L., Giovannini, G., B hringer, H., Reiprich, T. H., & Murgia, M. (2001). 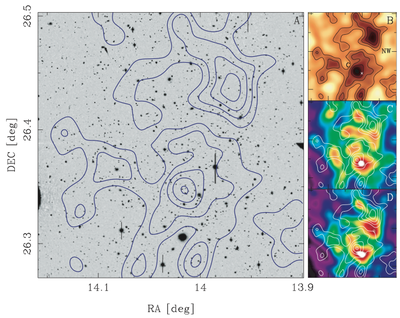 Radio and X-ray diffuse emission in six clusters of galaxies. Astronomy and Astrophysics, 376(03), 803–819. Gutierrez, K. & Krawczynski, H., 2005. 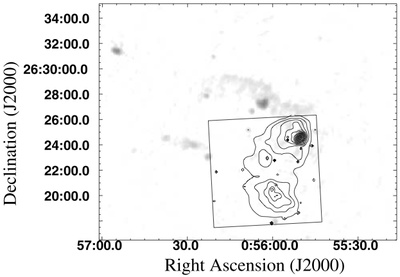 The Off‐Axis Galaxy Cluster Merger A115. The Astrophysical Journal, 619(1), pp.161–168. Okabe, N. et al., 2010. LoCuSS: Subaru Weak Lensing Study of 30 Galaxy Clusters. Publications of the Astronomical Society of Japan, 62, pp.811–. Oguri, M. et al. 2010, Direct measurement of dark matter halo ellipticity from two-dimensional lensing shear maps of 25 massive clusters. Monthly Notices of the Royal Astronomical Society, pp.2215.